All rooms have complimentary coffee/tea, fridges, electronic safes, hairdryers, heated bathrooms (bath and shower), wireless connectivity, TV. 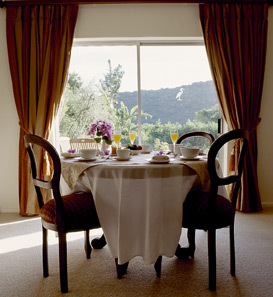 Our Honeymoon Suite has a private deck, adjoining lounge and mountain and river views. It has a king size bed, double shower and his/her basins. Complimentary sherry. Enjoy the magnificent river view from the queen size bed in this front room facing directly onto the river. This sun-drenched bedroom opens out onto a lovely deck which has mountain views. If it is too hot outside, relax on the queen size bed under the ceiling fan! Relaxing couldn’t be easier in this sunny bedroom which opens out onto the deck facing the mountains. Twin beds and ceiling fan ensure your comfort. The only downstairs bedroom, this light and bright room has direct access to the garden. You can enjoy a king size bed or two single beds if you prefer. 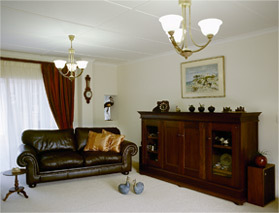 Access, furniture and fittings in the bedroom and bathroom are disabled/wheelchair friendly. Remote controlled lighting and fan.